It’s been a busy November for gaming here at Dice Hate Me HQ, even though most of that gaming has occurred outside of the primary HQ. 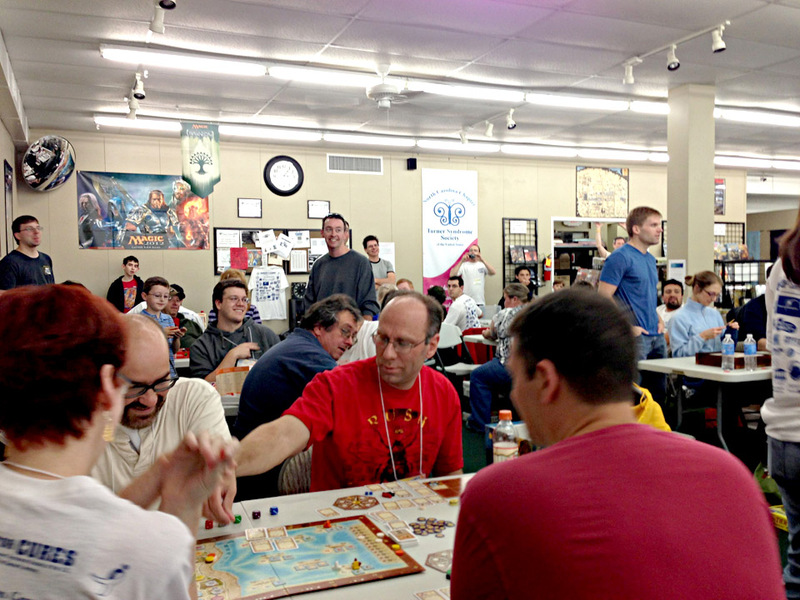 This past weekend while Monkey238 was hip-deep in ballet duties (it’s Nutcracker season, after all), I attended the 24-hour gaming marathon at The Gamer’s Armory in Cary, N.C. The 24-hour marathon is held each year to benefit Gamers for Cures, a charity organization dedicated to helping gamers give back to the community and to increase awareness for Turner Syndrome. My gaming buddy Dan Patriss spearheads this effort every year, and the guest of honor is his daughter, Lauren, who has Turner Syndrome. It was a great turnout this year, and a fantastic time was had by all, with over $8,000 being raised through donations, raffles and the delicious bake sale. Below is just a small sample of the gaming goodness that was going on – enjoy the pictures, and if you’re in the area next year, consider coming out and having some fun for a great cause! 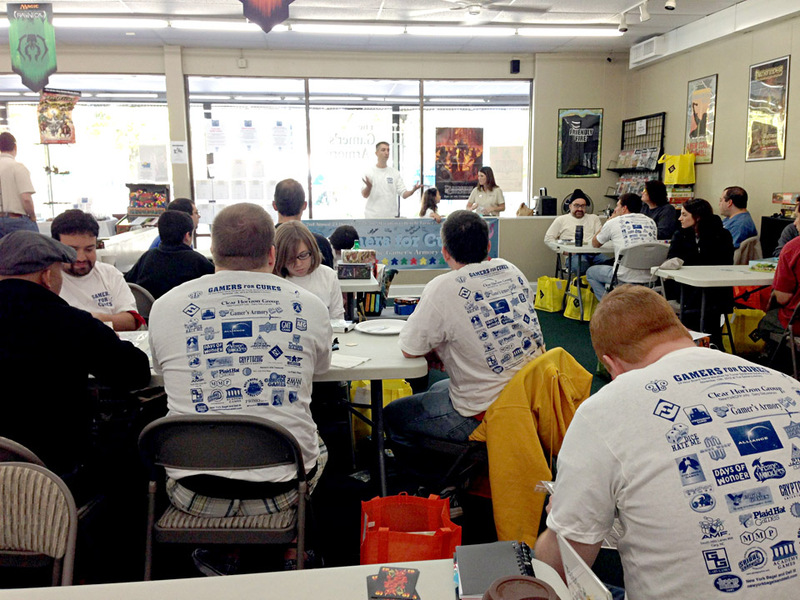 The fun started at 8 a.m. sharp, and there were tons of gamers there, ready for action. 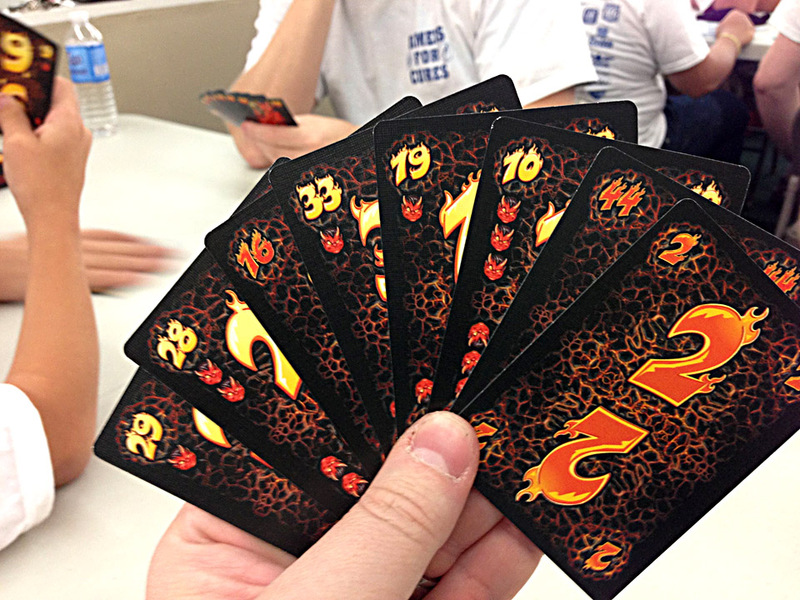 First game to hit the table – Little Devils. 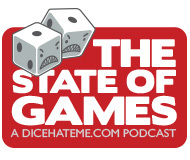 Marc Specter did a guest review on Dice Hate Me a few weeks back, and I wanted to see if it was as good as he said. Spoiler: It is. I liked it so much that I selected it as my free game when I won one of the hourly raffles later in the day! 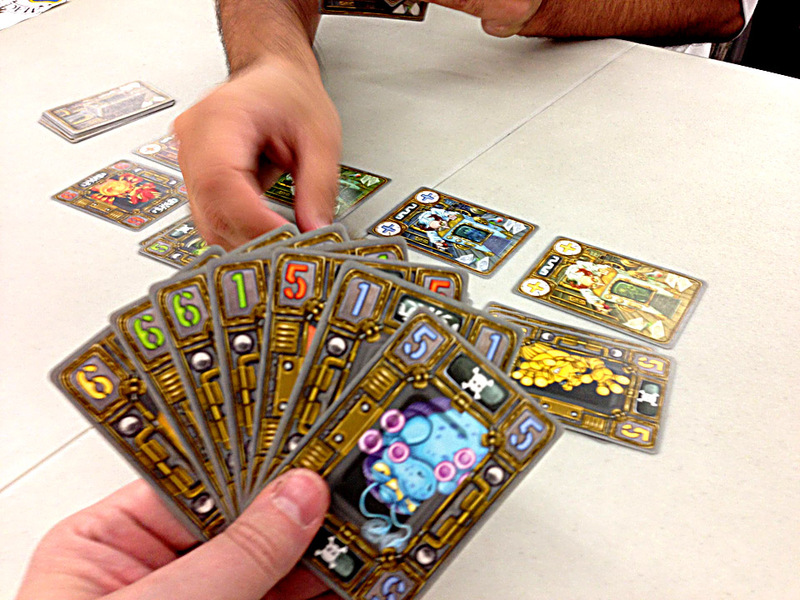 We also tried out Crazy Creatures of Dr. Gloom. It wasn’t a bad game, but after Little Devils it felt pretty limiting. 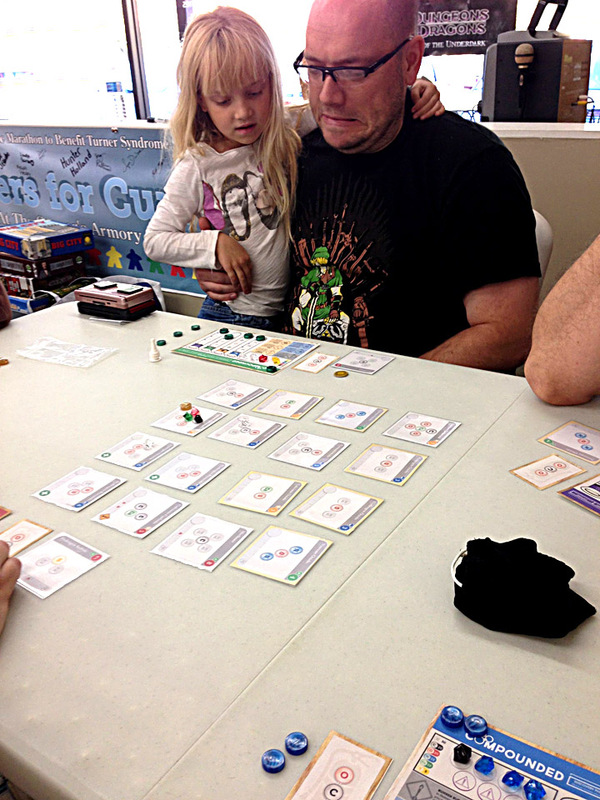 Lauren seemed to love it, though, so I think the critters and the simplified gameplay will really appeal to kids. 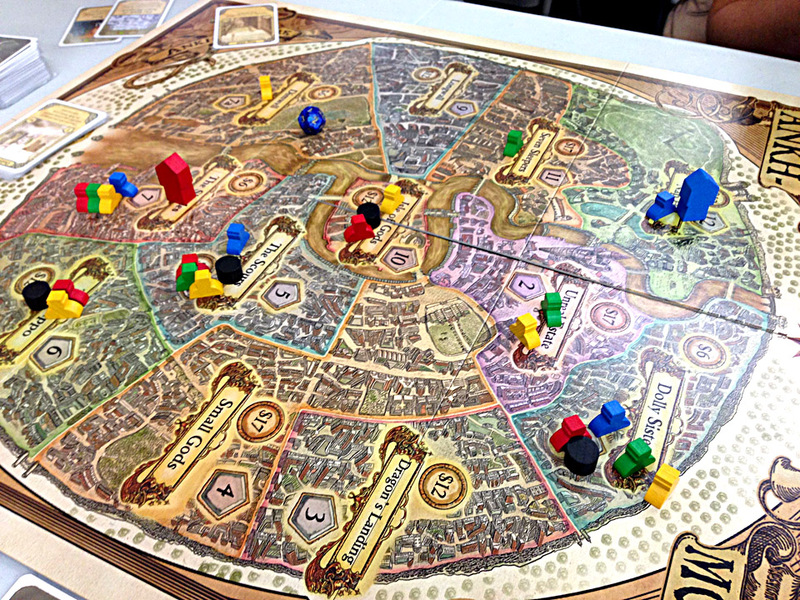 After warming up with the cards, I was roped into a game of Ankh-Morpork. I wasn’t sure what to make of the game when it first came out, but good word of mouth had me curious. Not being familiar with the Discworld universe, I was afraid that a lot of the game might be lost in translation. 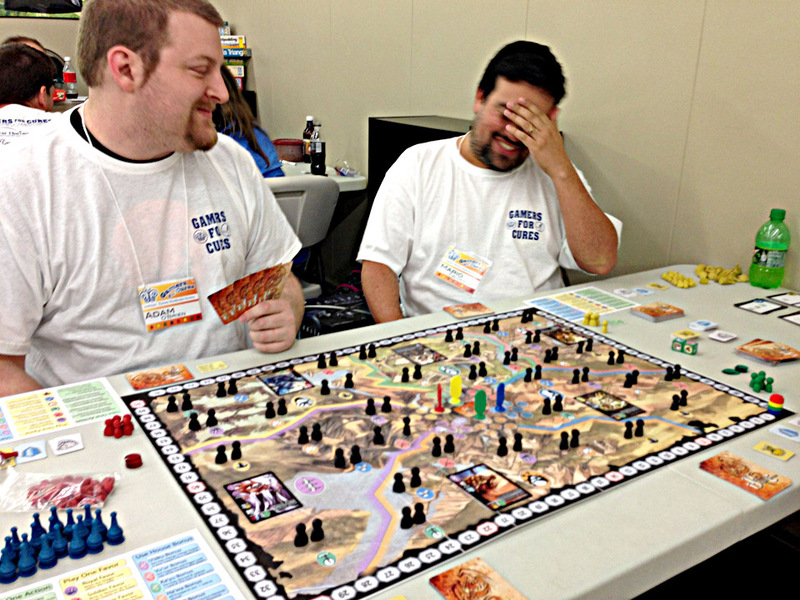 I shouldn’t have worried – the game is very easy to play and no knowledge of the source material is needed. I will say that the game is a bit chaotic and tactical, so if you don’t much care for either of those things, I’d stick to your true Euros. Everyone braces themselves during one of the hourly game raffles. Every marathon participant received tickets, and there were drawings for five (FIVE!) tickets each hour. I won twice, and scored Little Devils and Jet Set. A rousing game of old school Samurai Swords. AKA Shogun. AKA Ikusa. 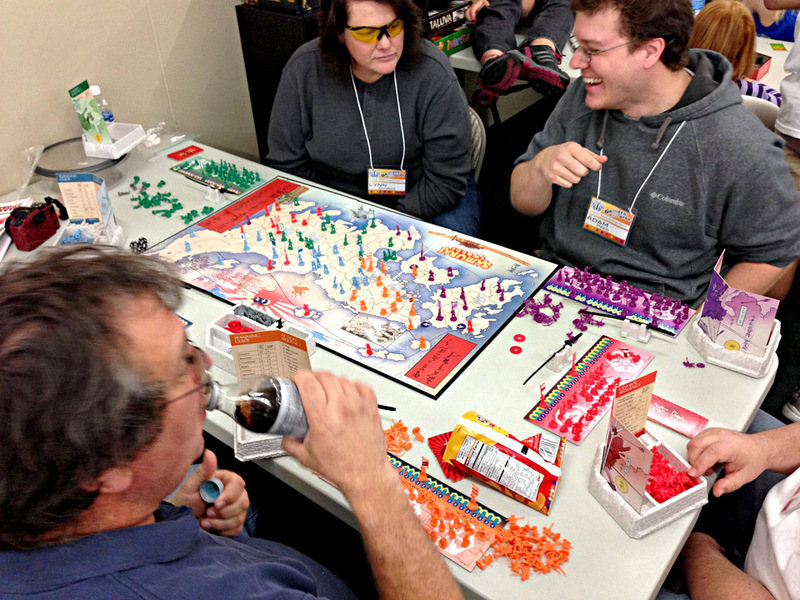 Here, Sword of Rome designer Wray Ferrell plays something… warlike. 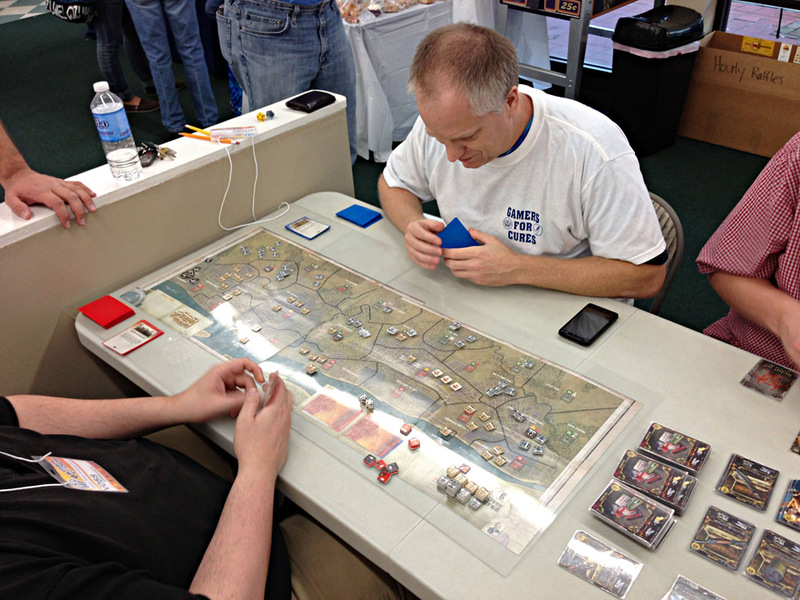 I didn’t catch the name of the game, but Wray was holding down the grognard fort with all sorts of wargames during the marathon! I was so jealous that I didn’t get in on this game of Endeavor. It’s been on my to-play list a very long time. 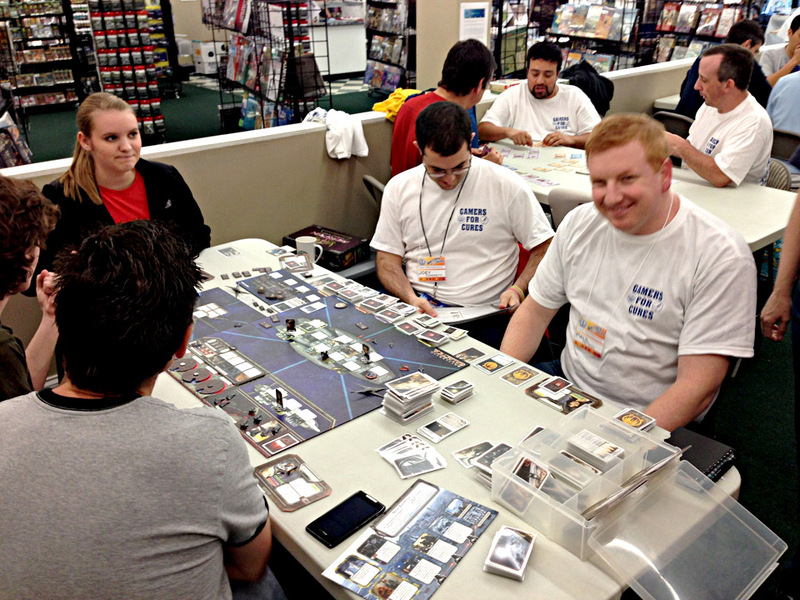 Here I catch the Redheaded Pharmacist himself trying not to look sneaky while playing the world’s longest game of Battlestar Galactica. 5.5 hours, people. I wouldn’t get to play games with Paul again until the wee hours when he stole my turtle in Vanuatu. Dirty thief! 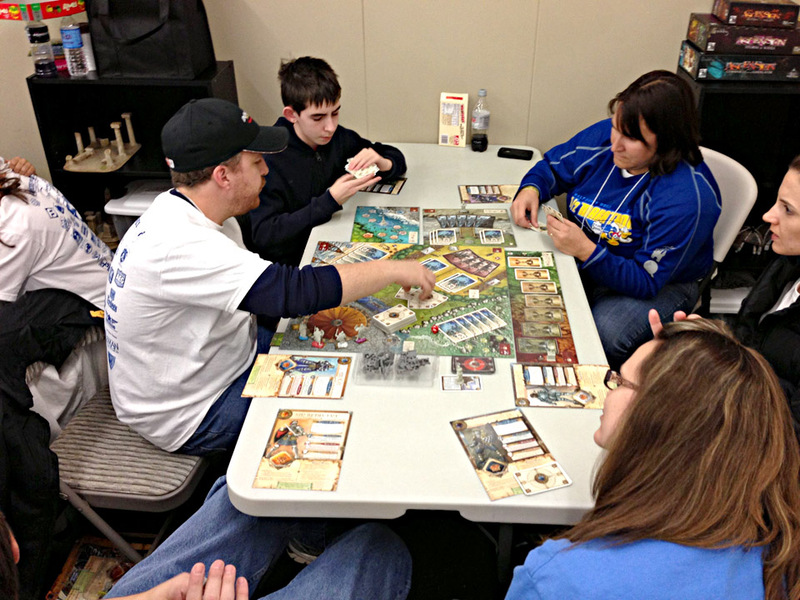 More traitor action in Shadows Over Camelot. Nooooo, I overpaid for shrimp!!! 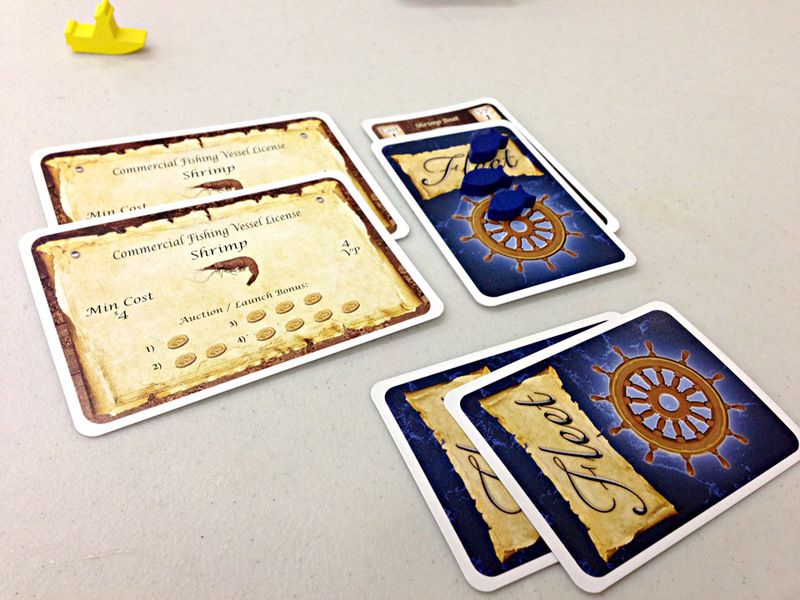 I don’t care, though, Fleet is still a blast even when I make a rookie mistake and my whole game crumbles like a house of cards. As the day grew into night, it was just about time for some caffeine. 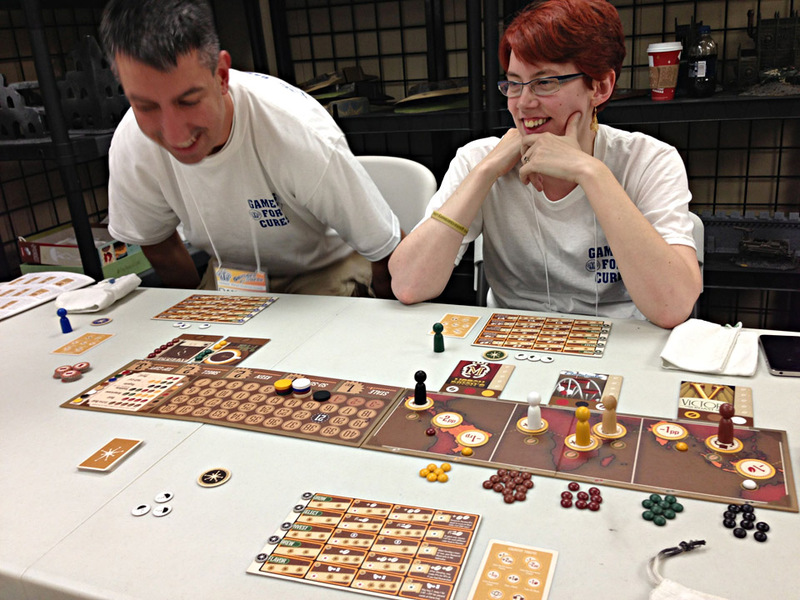 Thankfully, an 8-player game of VivaJava was just the pick-me-up a lot of us needed. This was, hands down, the strangest game of VivaJava I had ever played, with just about every player voting to Blend or Research the exact same way every turn. It was still awesome, as always, though – and 6 new players walked away as fans. We’d been holding the prototype of Clever Mojo Games’s Princes of the Dragon Throne in reserve for most of the day, waiting for just the right time when things settled down later that night. Around 11 p.m. Dan and I thought it was finally time to unleash the beast, and we introduced Adam O’Brien and Mario Calderon to this area-control, resource management deck-builder. It was a tight game for all four of us at different points during the game, and everyone agreed that Princes has the chops to be a big hit. Stay tuned to Dice Hate Me for more on this monster, and look for it on Kickstarter in the next few months! 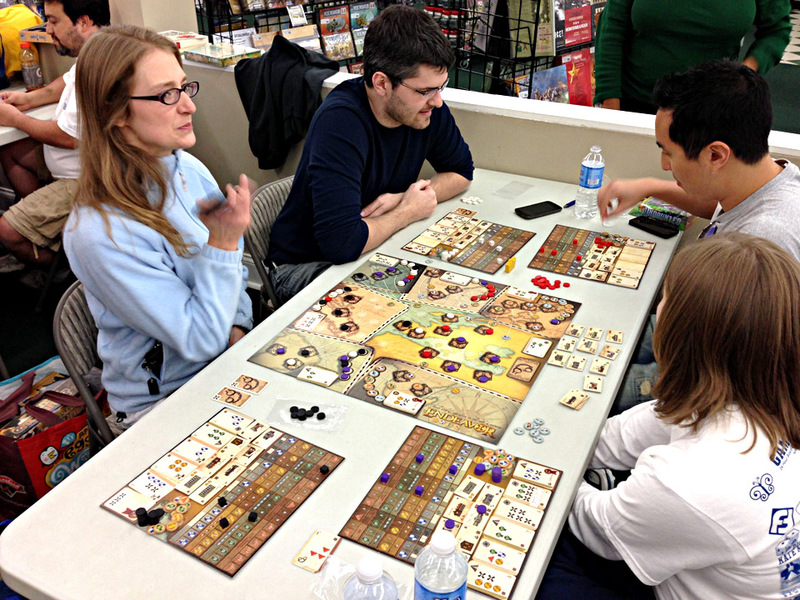 I have a short list of games I like to call my “White Whale List.” This list is comprised of a special group of games that have piqued my interest for so long and have yet gone unplayed despite opportunities at conventions and events. 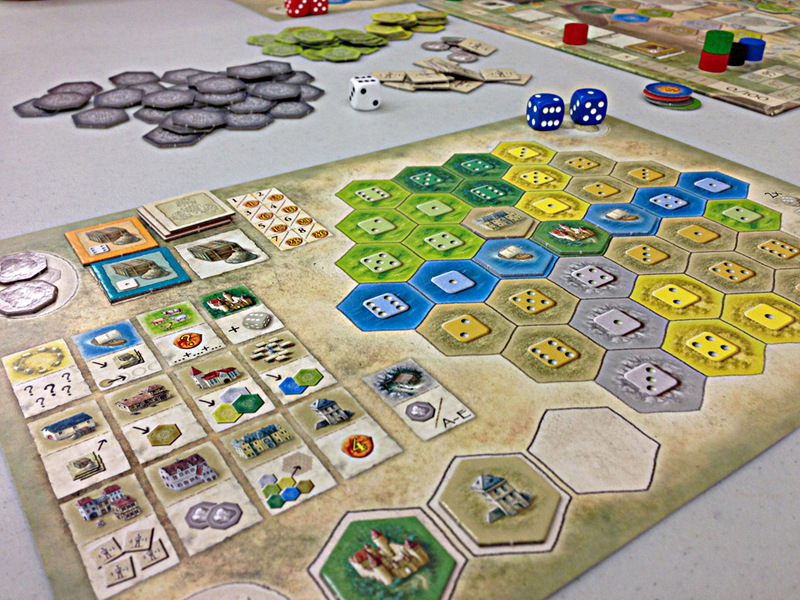 Castles of Burgundy (or Burger Burgen Haagen Dazs) was one of the select few, and when Adam O asked what we wanted him to bring from his collection, this was my first and foremost suggestion. Despite the very late hour and the fact that I couldn’t tell one building from another, the experience was exactly the Feldian mind scramble I expected – which is to say, sublime. And now I can move it to another list: the Must-Buy one. 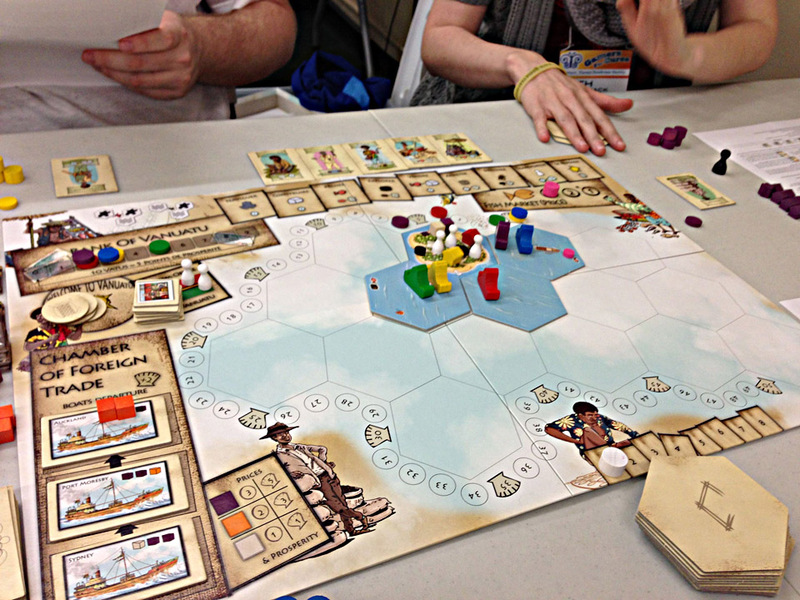 Here are a few tips for playing Vanuatu. 1) Do not taunt Vanuatu. 2) What happens in Vanuatu stays in Vanuatu. 3) Remain calm. 4) Guard your turtles. 5) Do not play Vanuatu at 5:30 am. 6) Guard your turtles. Now, all that said, what I can tell you about Vanuatu despite not finishing the game is that it is the most cutthroat, somewhat-befuddling Euro I have ever played, and I loved it very much. Next time, though – I’m breaking Paul’s fingers when he steals my turtles.